Just when you thought it was all set up for a make-or-break payroll release today, the ISM went and pulled the rug out from under the Fed's feet. Or did it? To be sure, yesterday's release was pretty execrable and put a dent into what had been a feel-good Q3. (Sadly, not every economy can be an unstoppable juggernaut like the...er....UK.) Then again, Q3 is still tracking at a healthy 3.2% even post-ISM according to the Atlanta Fed, and the ISM itself did not sound any undue alarm that the weak print was a herald of a darker future. Perhaps most importantly, the last time the Fed hiked with the ISM sub-50 was in....December, when the index was a point lower than yesterday's release. It does seem likely, though, that the ISM raises the payroll bar for a September rate hike. In that vein, the recent history of August payrolls to disappoint the headline consensus (albeit with substantial subsequent upward revisions) may be telling. Macro Man's model has undershot the actual figure quite substantially in recent months, and while the forecast is quite a bit higher this month it still rests below consensus at 160k. In any event, yesterday's market response to the weak ISM confirmed, if only temporarily, that it isn't quite time to give up on GDX quite yet. A 250k print today, on the other hand, might be a different story altogether. Elsewhere, the BIS released the data from its triennial survey of FX and interest rates yesterday, and the results were quite interesting. One can imagine global regulators cracking open a few bottles of fizz at the news that daily global FX volumes declined between 2013 and 2016. How much is down to Dodd-Frank type regulation and how much is down to risk aversion is up for debate; either way, the sharp decline in spot (i.e., directional) volumes was quite notable. Although the story wasn't quite the same in interest rate derivatives- total volumes went up again- it was interesting to note that the volume executed by large dealers declined for the second survey running. This would certainly suggest that the impact of regulation is beginning to bite. 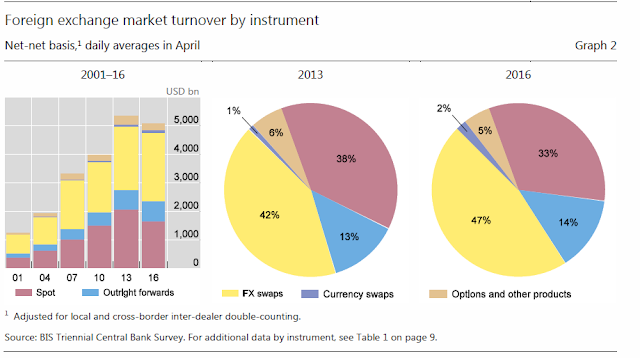 Interestingly, even though the US has mandated that swaps now trade via a SEF, volume in those instruments rose- and volumes in swaps traded in the US essentially doubled since 2013. Frankly, Macro Man isn't quite sure what to make of that. On the flip side, interest rate derivative volumes collapsed in the Eurozone, falling by more than 40% since 2013. As you can see from the chart above, US volumes exceeded those denominated in euros for the first time this millennium. While this may well represent a crowding out of private sector activity by the ECB's monetary policy, it's worth noting that this impact was not observed in anything like the same magnitude in the US during its period of financial repression monetary policy. Perhaps it says more about Eurozone banks than it does the ECB? Either way, the survey represents a sobering reality check for those of us who do macro for a living. For much of the past few years it's felt like the authorities are trying to strangle the life out of the market. On this evidence, they just might be succeeding. Note: It seems as if MM emails may be going to spam folders all of a sudden. If you have quit receiving emails recently, please check your spam settings and ensure that Macro Man is a safe sender. There's an unbelievable almost doubling of USD single ccy swaps dealt in US. Most of the increase, as far as I can tell from the BIS data is due to an increased trades from across-the-border financial parties. I do wonder whether this and the colapse in EUR aren't really massive IR punts - EUR played its rates out, and US didn't, and in the OTC space swaps are the way to play this. 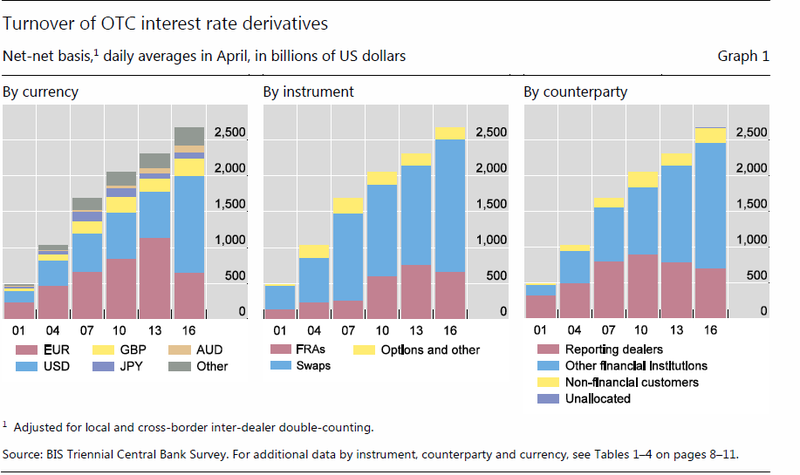 Of course, it could be all also perfectly valid hedging of USD floating rate notes issued by corporates all over the world, but then you'd expect this to show up on the corporate side too.. Believe it or not, after sitting on the sideline this entire week waiting for NFP, I bought the initial dip in the USD as well as short the pop in /es spooz. Whether this trade will be a day rental or a multi week hold, we shall soon see.. Unless this was a real stinker, <100k, I don't think it matters all that much given the nearly two consecutive +250k jobs prior to August. Given that August will most likely get revised higher as it usually does by a factor of 55k or so in 3mo time. Price.. which kind of all that matters to one's P&L... has been "different" this time around - any prudent observers of the tape would agree. I think significant strength underpins overall USD this time around. Yield differentials of nzd/usd or the usual chopiness/heaviness of usd/jpy do not seem to not apply very well this time around. 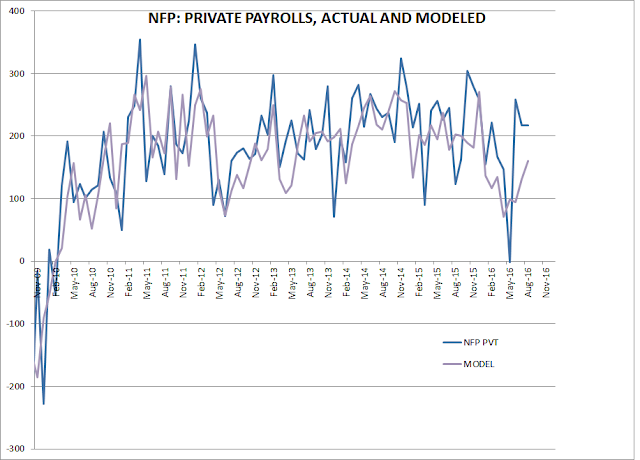 The question is what the FED consider a low print <100? Unemployment rate at 4,9. Will they really be looking for 150+ ? almost text book - by Tuesday you will have made money. FMPM -- nice call. The price agrees with you! Well this reaction is very interesting. Dollar up, EU stocks up, US stocks up, EM/raw materials up and treasury yields up. Isn't this one of those LB trade marked holy trios again that isn't never supposed to last too long? @anon 3:48 - care to elaborate on your mREIT comment? Specifically what you saw as bullish? Thanks. Just trimmed half of my exposure to lock in profits.. it would've been foolish not to given that both the yen and the kiwi moved 150pips in my favor in span of two hours. But for the most part, it looks like I'll be taking the remainder home and sit on it over the labor day weekend. I know I've never posted on here before, but mainly because of the strict clause that even anonymous posting could've effed me over while I was at xxxxx, ha. They recently bought me out for a decent sum, I guess I finally have the liberty to post here and do whatever the hell I want, ha. Perhaps I should've chosen a gentler word than "fired" but hell, what's the difference? MS expects ECB to widen QE program to senior bank debt. Sees eligible universe of senior bank paper to be €881bn. @FMPM - I'd guess most of the grizzled denizens of this board think of 'fired' the same way soldiers think of 'taking a bullet', not desirable but an occupational hazard and potentially character and skill building in the long - so no need for 'gentle'. Look forward to your posts and have a good weekend. @thebondstrategist if two traders at a private firm were engaging in the practice the reuters article alludes to, i.e. buying and selling intra firm to influence pricing, they'd be carted off to prison for illegal wash trading - please don't bother holding your breath waiting for Mario Draghi to be in handcuffs. @washedup: they're magic people so i don't wonder about nothing anymore..
july/august has been great for all the out of work traders selling weeklys at home! no bid for bonds today? Still long all equity markets, as they surge higher. Wake me up when equity indexes are a few thousand points higher. "If you need some cash flow $REM is full of mREITs, mostly at 8-15% disco's to BV"
Yields about 11%. 62yo HFM is all in with the $251,600 in his 401k plan. only long all equities with all CBs backing you up? shame on you mother fucker if you are not leveraged up 100x. Cannot say I have been emulating 12yr ,but in the UK markets I have to say it has not hurt to run some long equity picks without hedging. Moreover, I like those picks a lot more than I like the bond holdings that I sold. UK equity ended the week with what looked like some cover buying if I am not mistaken and I don't think I am. UK and US equity was being held heavy short across our wunderkind SB platforms. I don't use them personally because I don't use leverage ,but I like them in a contrarian sense as just one more pointer to note in positioning. I still do not like the leverage position in markets because at this level any policy surprise is going to hurt badly so I am watching position sizing and allocation and trying to remember not to be too greedy on long risk trades. The latter sums up my continuing view which is 'trade' don't invest in this enviroment. I hope you are joking. If not, I'm sorry for mentioning $REM. Bad move. Can you hold back your cursing on this blog. My 3 young daughters read this everyday. No need for that kind of language here. No one likes the US or their arrogantly acting officials representing it. It has nothing but forced puppets, not partners. The days of trying to define "international law" all by yourself are close to being over. I remain long equities with a conservative SP500 target of 5000-ish. I also expect to see UK, EU and Japanese equities join the US in making ATHs by year end. Or the Fed grows a pair and hikes 50bps in September ? Forgive me , it's the meds making me delusional. The US can celebrate this Autumn though when Obama hits the door. His political obituary summarised 'never has a President promised so much and delivered so little'. One can see his historical sobriquet now 'The Caretaker'.